The Eiffel Tower in Paris is to close on Saturday amid fears of further street violence from "yellow vest" anti-government protests. In an interview with TV channel TF1, Mr Philippe said 8,000 police would be deployed in Paris as well as a dozen armoured vehicles. He repeated an appeal for calm but added: "We are facing people who are not here to protest, but to smash and we want to have the means to not give them a free rein." Earlier, Mr Philippe suggested further concessions to protesters, telling the Senate that the government was open to new measures to help the lowest-paid workers. How will Paris be affected? Culture Minister Franck Riester said the Louvre and Orsay museums, opera houses and the Grand Palais complex were among sites that would be closed. "We cannot take the risk when we know the threat," he told RTL radio. Police have asked stores and restaurants along the Champs-Elysees and other major shopping streets to stay closed and to remove any outdoor items such as tables and chairs. A series of football matches have also been postponed on Saturday. They include those between Paris and Montpellier, Monaco and Nice, Toulouse and Lyon, and Saint-Etienne and Marseille. What other protests have there been? On Thursday young people took to the streets, protesting over education reforms. Students have been angered by President Emmanuel Macron's plans to change the end-of-school exam, known as the baccalaureate, which is required for entrance to university. Critics fear the reforms will limit opportunity and breed inequality. 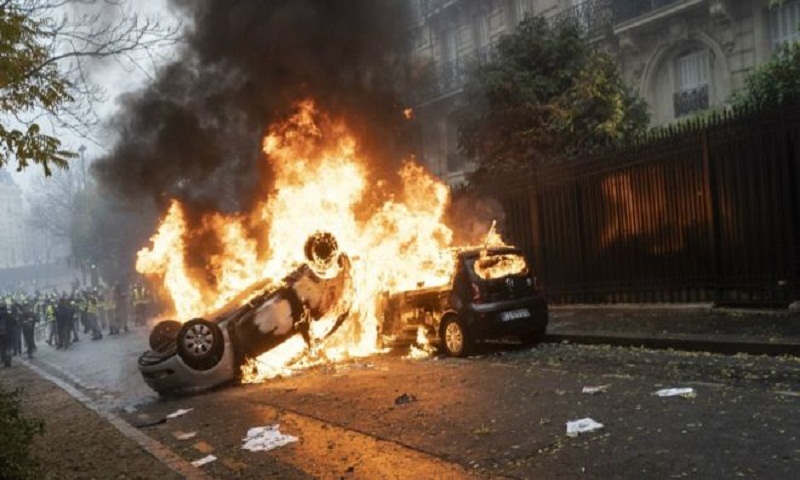 The "gilets jaunes" protesters, so-called because they have taken to the streets wearing the high-visibility yellow clothing that is required to be carried in every vehicle by French law, initially complained at a sharp increase in diesel taxes. The government later scrapped the plan but the yellow vest protesters were not placated. Last week, the movement - despite a lack of central leadership - issued more than 40 demands to government. The protest movement has gained momentum via social media, encompassing a whole range of participants from the anarchist far left to the nationalist far right, and moderates in between.